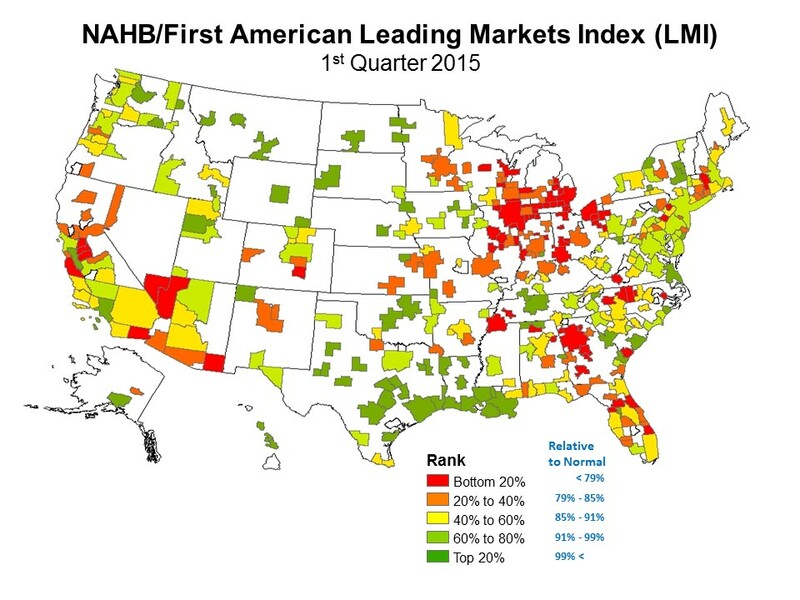 Local economies continue to move toward economic and housing normality according to the NAHB/First American Leading Markets Index. The national index moved one percentage point to .91 in the first quarter of 2015 and 4 percentage points from the same quarter last year. The index measures proximity to normal through three elementary indicators of economic and housing stability: the level of single-family housing permits, home prices and employment as compared to the last period of normality for each. A value of one means that indicator has returned to normal. The three are averaged for a single measure. More than 350 metropolitan areas are scored in this fashion. In the first quarter of 2015, 68 markets or metropolitan areas had an index value of one or greater, an increase of 7 markets in one year. The increase is heavily driven by the increase in metro areas employment index. The number of markets back to or above normal in employment levels increased from 30 to 56 over the year. The number of markets returning to house price levels last seen in the early aughts has remained high at 95% of all metros measured. The slowest indicator to return to normal has been single-family permits as only 7% of the listed metros are issuing as many or more permits compared to the early aughts. The markets leading in recovery are leading in employment and vice versa. Strong employment growth leads to the need for more homes and the markets showing the greatest improvement are in strong employment markets, primarily in energy production and refining. Half of the 68 metros with an index value of one or above are in the oil/energy belt in the middle of the country. Note: The publicly available data used to compute the LMI reflects the updated boundaries and list of Metropolitan Statistical Areas made by the Office of Management and Budget (OMB) as a result of the 2010 Decennial Census. The historic data used for comparison were also updated to reflect post-2010 geography.